The study revealed that, in comparison, 17% of fathers had experienced similar issues. More than two-thirds of the affected mothers sought professional help - suffering from conditions such as acute stress, severe anxiety and postpartum depression. Lauren Doyle experienced post-traumatic stress disorder after giving birth to her first daughter Ava. "It just wipes you out really - you just become a completely different person," said the mother-of-three from West Yorkshire. "I'd get upset over something as simple as we'd ordered a takeaway and they'd forgotten the fried rice and I just couldn't stop crying," she said. 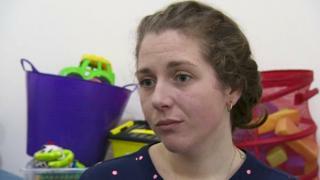 The birth was physically traumatic and it meant that Lauren and her daughter were looked after in different hospitals, which prevented them from developing a strong bond. "I've got to put up with feeling this way." Lauren would cry in the shops and find herself getting angry and upset all the time. She also felt burdened with guilt when she couldn't breastfeed. "It's another factor that makes you feel isolated, that you're not being the best mum," she said. Lauren's not alone. Many of the parents surveyed reported feeling criticised by a large number of people. Mothers said their parents were the most critical of their parenting (26%), followed by their spouse/partner (24%) and other family members (18%). About 14% said they had been criticised by strangers, compared with 5% of the 800 fathers who responded to the survey. New parents can experience troubles in the workplace as well. About 30% of mothers who responded said they had felt discriminated against at work through being a parent, compared with 14% of working fathers. According to Citizens Advice, new mothers are reporting increasing levels of unfair treatment at work. The survey also found women turn to online forums for support more than men. A total of 60% of women said they had received emotional support from their friends, 56% from their partner and 18% went online. But 15% of mothers and a quarter of fathers say they didn't receive any emotional support for their parenting at all. This is despite a growing understanding that postpartum depression affects men as well as women. For Lauren, receiving support in her local community was challenging because she had recently moved to a new area and therefore didn't have many established friendships. The mother-of-three relied on her parents-in-law and her husband, Rob, who first noticed there was a problem and encouraged her to seek help. "I didn't know where to go to, where to turn to, to get support," she said. She saw a doctor after the birth of her second daughter Isla. She said all they could provide was medication and eventually received support through the parenting support group Pandas. "It looked so effortless being a parent and that's what I thought it was going to be," she said. Six years on, Lauren says things have improved. "I'm happy - I feel that I'm doing my job properly now." Watch the live stream of Mum Takeover on 5 live on Tuesday between 13:00 GMT and 15:00 on their website or Facebook page.